The GL-Connection software included with GL7000, GL2000 and GL980 can control devices. It is an integrated application software for the GL series, the GL900, GL840, GL820, GL240 and GL220 can also be connected and controlled. 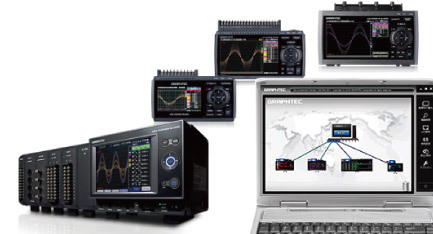 The measurement signal can be displayed in various types of screens adapted to applications. The GL-Connection software supports up to 2000 channels and up to 20 units of the GL series. It splits up to 4 windows and each window can display different format for easy monitoring signal in large channels. 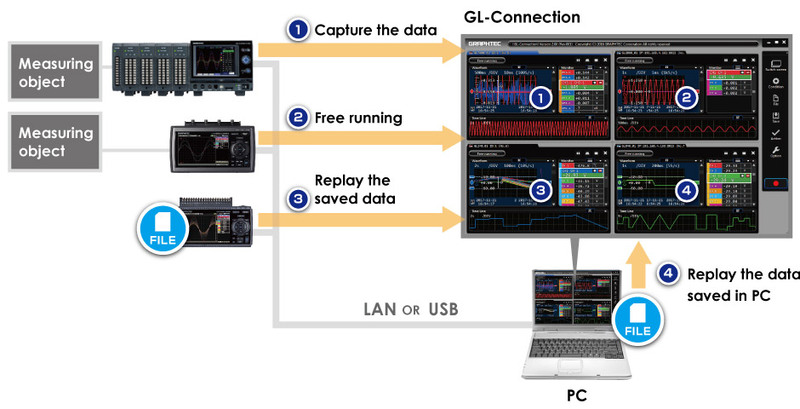 When the unit of GL series is connected to the PC via Ethernet or USB, the GL-Connection software can manage a various information such as the data in capturing, data in the free running - displaying data without saving - and data in saved file. The GL-Connection software can also display the data saved on the PC. The tab function allows you to manage the screen so that it can be intuitive and easy monitoring. Screen displayed in multi-window can split using the tab and selected items can be displayed. Items to be displayed can be set in detail, such as the GL body level, individual input module level, the specified channel, and other settings. When controlling GL7000 from PC, it is impossible to operate on the main unit to prevent conflict of setting conditions. It allows to operate the main unit even when GL7000 is under controlling from PC. 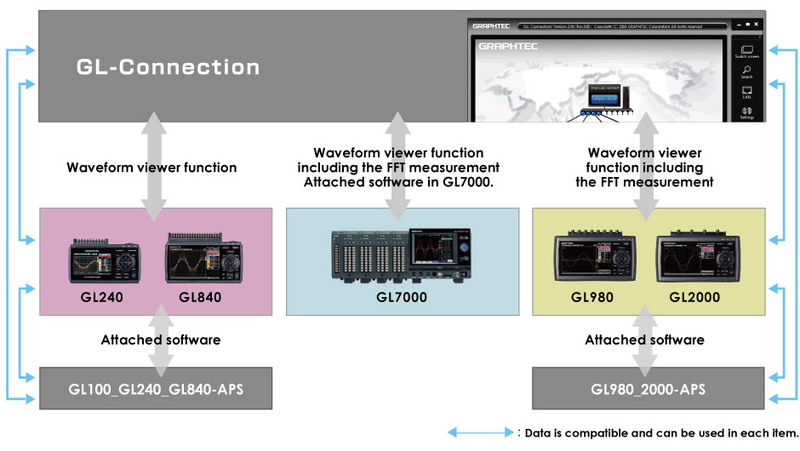 GL-Connection software is an integrated application software for GL series including GL7000, GL2000, GL980, GL900, GL840, GL820, GL240, and GL220. When the software is used with the GL7000, it can be controlled and displayed the data including the FFT measurement. When other GL series is used, the software has mainly the waveform viewing function and have also the function to control basic items. Data captured by other GL series is compatible with the GL-Connection and APS software. GL-connection software will be able to manage multiple units in a mixed condition of the GL series. Data integration function allows you to understand the overall situation immediately by creating single file at the same time axis from multiple data file saved by each unit. GL220 Yes It make operation for each unit. It makes manually after completing the data capture. All units make the action in a single operation. * The timing of the action is maybe synchronized. It makes automatically after completing the data capture. It can also make manually. * Sync cable is used to connect each unit. GL7000 No All units make the action with full synchronization in a single operation. It makes automatically after completing the data capture. It can also make manually. Way of operation or action vary by type of connection that is the No.1 to No.3. * Full synchronization can be made when the sync cable is used in the GL7000. The integrated file cannot be created when it exceeds 100 units or 100 channels (analog channel + logic channel). Data will be integrated with using fastest sampling speed when the sampling speed in each file is different. The data format in integrated data file is the GL7000 format even if GL series is included to capture the data. High speed sampling is limited by the number of recording channels, connected modules, and the recording destination, etc. Even within the following limits, transmission may be incomplete due to transmission delays with multiple module connections, especially with LAN connections. If this occurs, please reduce the sampling rate. For more details on the GL device limits, please refer to the main module user’s manual on CD-ROM. * The GL device’s calculation function cannot be used with this application. There is no calculation function in this application. (Application limits) There are estimated sampling settings for PC recording depending on the volume of data communication. * When connecting through an existing network such as a LAN connection, communication may not be possible within the following limits. In such a case, please use a USB connection, or set a lower sampling rate. Module Settings List Settings of multiple modules can be displayed simultaneously, and setting conditions can now be saved as CSV data. Remote Lock On/Off Feature Setting operation is available on GL7000 under control of GL-Connection. Statistics / Display Display statistical calculation result. Check-sum function It is a function to check data file consistency. The check-sum code is recorded into the file when data file is created by the GL unit. When the content of the file is changed by someone, the check-sum generated from the file does not match with the recorded check-sum, which indicates that the file has been tampered with. * This software and the firmware on the GL unit need to be a version that supporting the check-sum function. File operation Converts binary data to the CSV data (specific period, all data in one file, multiple files), Creates a new file with compression or by consolidating multiple files. Search function Search any point on the data.